It goes without saying that socialization is not specific to Berger Picard but this breed requires more than the average breed, for that reason, I find it important to outline the rudiments to anyone interested by the Berger Picard. A well socialized pup will become a balanced dog with whom you will be able to share a huge range of activities and pleasures. What can be cuter than a happy Picard puppy wagging his tail to welcome everyone he encounters? What’s sadder to see one moving away from visitors, with a worried look, hiding behind its owner’s legs? Temperament is shaped by genetics, the nature of the individual and the environment. So, as a puppy buyer, it’s your job to check out your puppy relatives to see if they are outgoing and sweet of shy and afraid. It’s also your duty to make sure that the environment in which he grows allows him to explore, enjoy new experiences and make new friends. This does not necessarily happen by itself! Dogs do not generalize as well as humans. Even though they are happy about meeting new people at your house, it doesn’t mean they will want to do the same in unfamiliar surroundings. 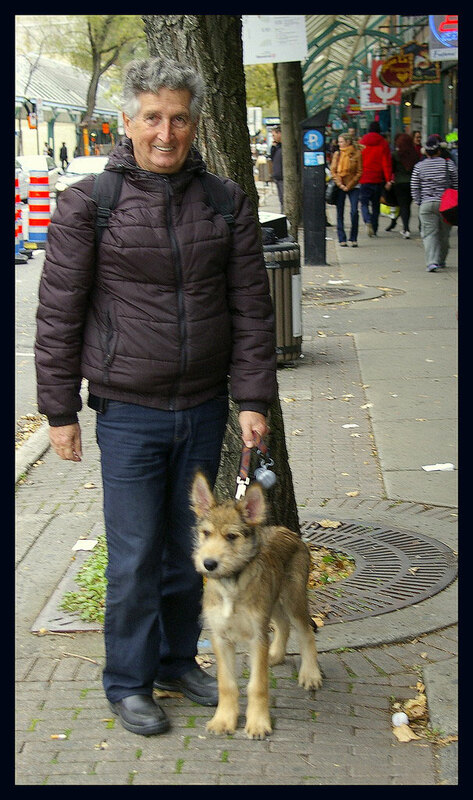 In order to help a Berger Picard puppy, you can provide him with new and positive experiences in different environments so that he learns that new people and new places are synonymous of fun. Puppies must also accept to be examined by strangers; indeed, that’s really what happens when you bring him to the veterinarian. A well kept puppy will not normally need to visit the vet often; the latter shall remain somewhat a stranger. The puppy must accept to be manipulated, hold and examined from every aspects even if it tickles. Another factor to consider is that all puppies go through a fear period during their development. During this period, the puppy may feel frightened by something or someone, even just a loud noise. A fear occurring during this period can linger for the rest of its life. The first fear period occurs around the eight of nine weeks of age and last for about a week. This timing explains why many breeders are reluctant to allow their pups to leave for their forever homes before that age. Another fear period sometimes called the avoidance period happens when the puppy is around four months and last about two weeks. During these two weeks, avoid pushing your Berger Picard puppy to do more than he is capable. Traumatic experiences during this fear period may to lifelong challenges. If you find yourself in a frightening situation for your puppy, redraw from this situation in the most positive way and make sure to expose your pup to the same stimuli ounce the fear period is over. If you think that your puppy has developed a fear reaction to some stimulus, you may want to work at reducing the fear through exposing your pup to that stimulus in lower intensities. One of the most important reasons to socialize your Berger Picard puppy is to get him used to different environments. For us, the environment is quite simple. It has a certain aspect and we perceive different sounds. Our senses of smelling and hearing are not as acute as those of a dog. For a young puppy, what’s surrounds him is a confused mixture of colors, sounds, smells and textures. So, bring him along to new locations. Do not always go to the same spots and locations – go downtown, to the post office, to the bank automated banking machine, go car riding. If your librarian is tolerant, bring him to the library. Bring him everywhere you can. By asking permission, certain restaurant managers will accept to let your puppy in on terraces. It’s a wonderful place to ask him to sit or lie down under the table. 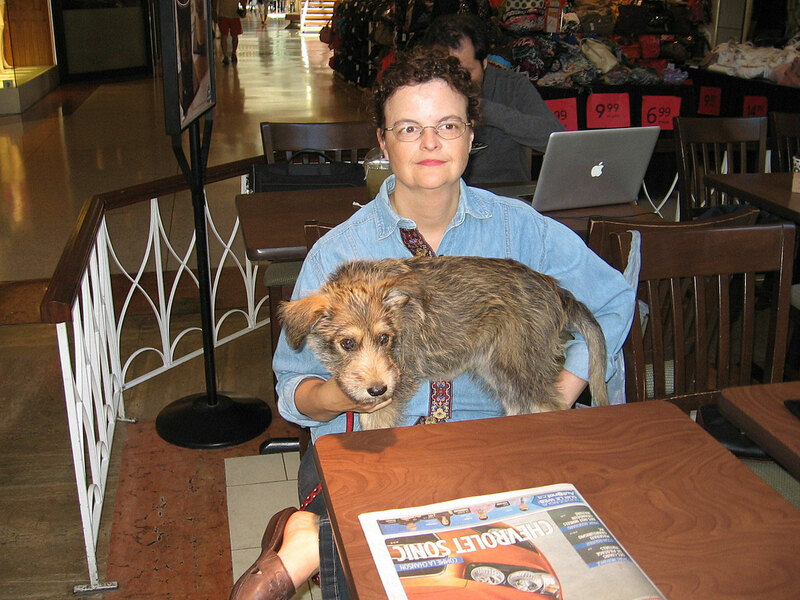 Your Berger Picard puppy will meet new people and some will ask to pet him. When possible, bring your Berger Picard puppy at your workplace. Make him a bed under your desk or workspace, so that he can be close to you but out of the way of feet and wheeled traffic like office chairs. A puppy pen represents a small expense compared to the benefits you will gain if you dog have permission to follow you at work. Bring your puppy to all the stores that sell dog food and accessories. Do not hesitate to stand outside the principal entrance of a big box store or the grocery store for about 20 minutes. Your puppy will most likely attract people and this is such an easy way to socialize him. I also bring my puppies to the bank. Once the bank is closed, I bring them in to the automated banking machine. They get used to glass-paned doors and motor doors that open automatically. I also try to bring them in commercial buildings where they can get used to escalators (first, I hold my pup in my arms). Some shopping centers allow on-leash dogs. Make sure to ask before going in with your puppy. Go for a walk in the neighbourhood parks. The first few times, it’s best to go when there only a few people in the park. Then, choose sunny week-ends when the park is quite busy. In order to socialize your puppy with children, bring him to schoolyards and playgrounds. Do not get closed to children, they will most likely be attracted by your pup anyway and will come on their own. Allow kind children to pet your puppy, touch his feet and tail, stroke him under his chin and behind his ears. Watch closely and make sure that the children handle your puppy gently. Otherwise, take him in your arms and go away without making a fuss. Also, be sure that your puppy is docile with children. It must go both ways. I tend to bring very young pups to places where older children play and when the puppies are order; I allow them to play with younger children. 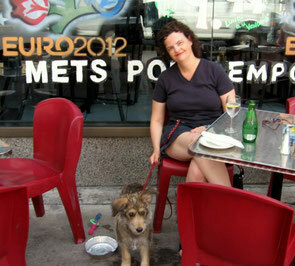 Outer events like fleas markets, sidewalk sales, public markets are blessings for puppies socialization. Make sure to leash your puppy when people are flocking, you want to socialize your pup not get him walk over! Dog obedience courses are a great opportunity when you have a joyful puppy. Often, those classes are full of bigger rambunctious dogs. The best way to go about it is to start with a kinder garden class. se your personal judgement. If you pup is already used to noisy areas and shows no fear, obedience course might just be the thing for him. Often, you can visit the class first without registering. You can also bring him to show handling classes where emphasis is on learning on walking on leash and accepting to be handled by strangers. When going out with your Berger Picard Puppy, makes sure to always bring along poop bags to clean up after him. This way, you will always be welcomed everywhere you may choose to go. If you puppy shows signs of fear, do not be overly worried. It’s not surprising he might feel a little worried when strangers lean above him. Either take him in your arms to bring him to eye level or ask the person to lean to his level. Let the people pet him on his back or under his chin rather than on his head. If your pup feels uneasy, don’t make a fuss, otherwise your pup may feel even more frightened. After all, you want your pup to overcome this feeling! Dog parks are not the best place to socialize a puppy. Other dogs may be malicious. Before going to a dog park, make sure to choose one with a good reputation. Certain dog parks have well-established rules; those are much more appropriated to avoid bad experiences. Allow supervised games only with friendly dogs and puppies of the same size. Another disadvantage of dog parks is that you don’t know if the other dogs are healthy. Do not let your puppy smells other dogs poop. Either pick them up or avoid dog parks where people do not clean up after their dog. Always carry in your pocket or pouch dog treats. If you pup feel uneasy about an object or situation, be ready to offer him a treat as soon as he shows that he wants to investigate what has surprised him. It’s also a good idea to ask people to offer him a treat. Don’t let your puppy annoy a person that doesn’t care about him. Some people are allergic or simply scared of dogs, even puppies. You will identify those people easily: they don’t look at you or your puppy. Continue to walk while talking to you pup; he must learn that he must not insist to meet everyone.